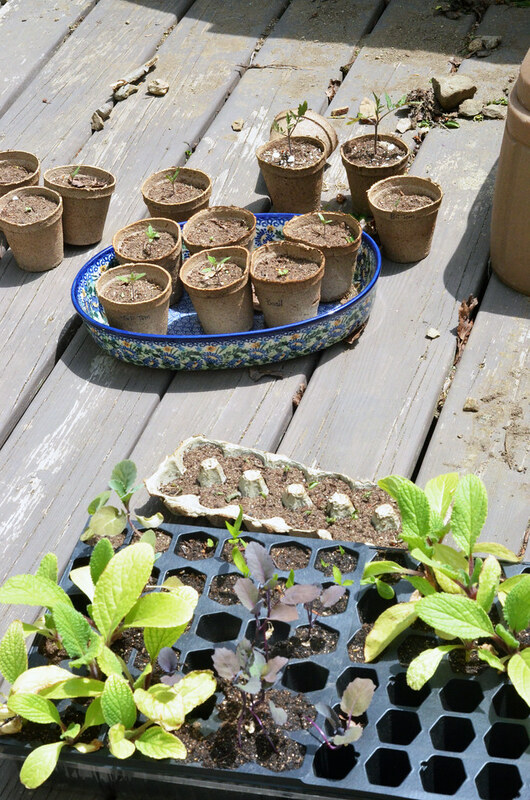 Borage, cauliflower, cabbage, and pepper plants soon to go into the ground. Our last average last frost date is around May 4th, so after once it passed, I transplanted the borage, cauliflower, cabbage, and nasturtium plants into the long bed and the first two short beds. 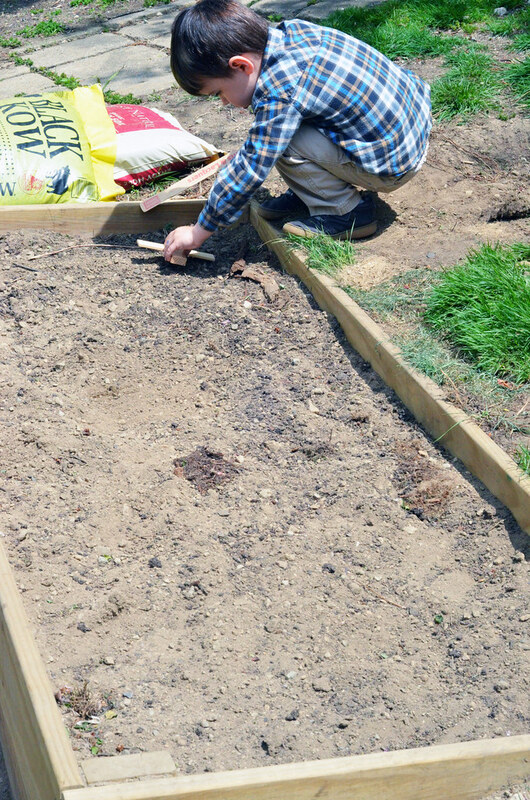 I also direct seeded lettuces, carrots, marigold, cucumber, zinnia and dill seeds into the same beds. 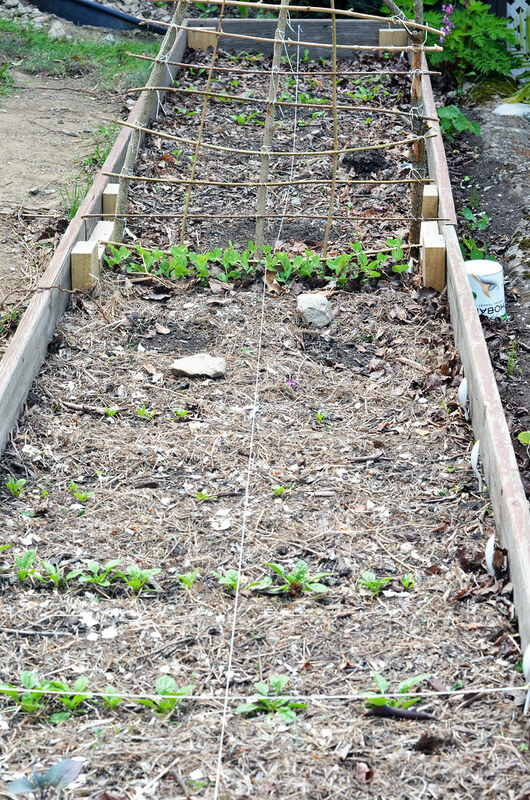 Arugula, peas, broccoli, and spinach--direct seeded in March and coming up now. By this point, the peas were coming up nicely. 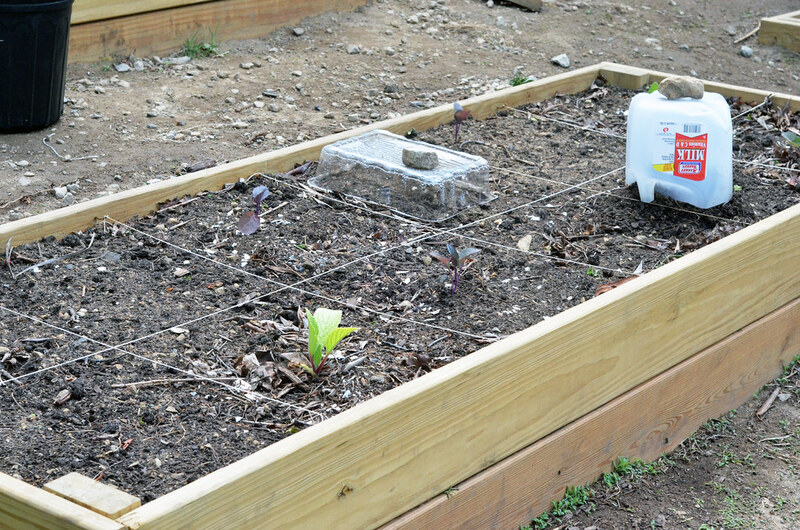 The spinach and arugula has also sprouted up but were not growing very quickly. We were still having some rather cold days into late May. Borage and cauliflower in the ground; marigolds and cucumber seeds direct seeded and incubated. Bed has been partitioned off into 12"x12" -ish squares (slightly bigger because of the bed dimensions). I ended up covering the seeds with plastic covers ( milk jugs with the tops cut off and those plastic clamshell containers that salad greens come in at the grocery) to help keep in moisture and heat to aid in sprouting. Helping with the partitioning off. 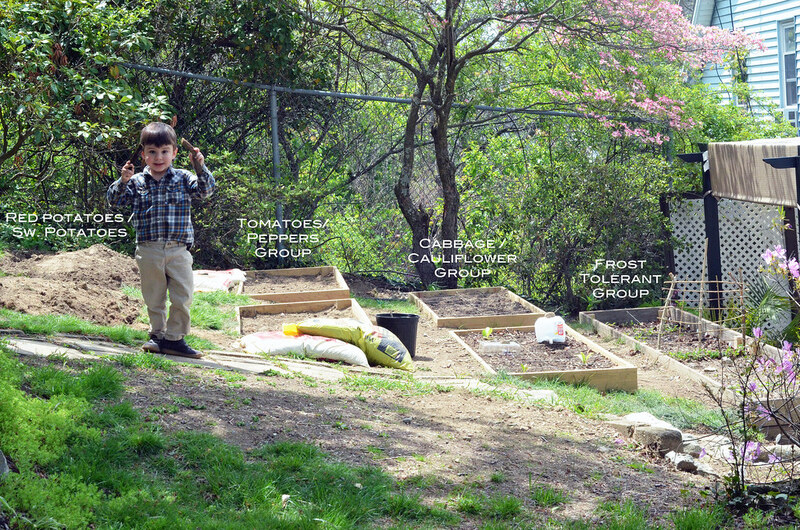 I learned about partitioning in The Downsized Veggie Garden, and the technique helped to keep me from over planting. However, looking at the garden now, I think I could plant it more fully next year as most of my plants are not taking up the amount of space the seed packets suggested they would. 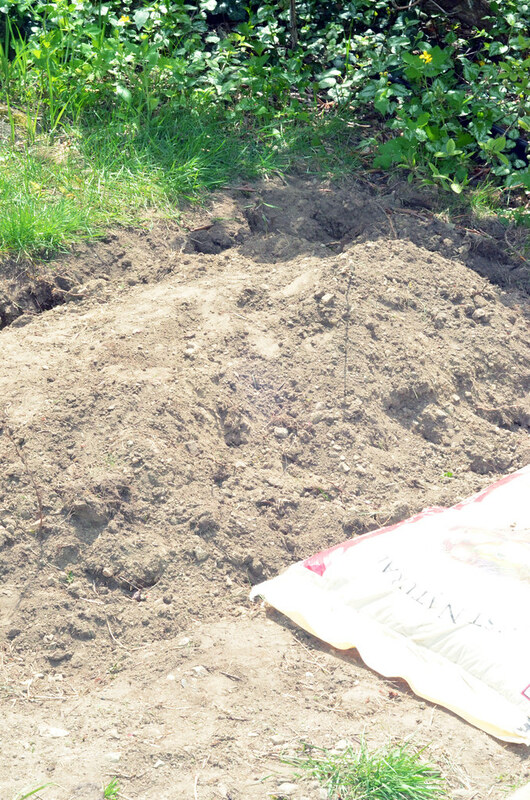 Potato patch de-rocked and ready for compost to be added. Due to time and finances, we didn't get around to making the last two raised beds that will eventually go in the back of the garden. However, I felt I needed that space for cultivation so we dug it up anyways and put the potato and sweet potato slips in once they arrived. Sweet potato patch still needs to be de-rocked. Fish heads from our local seafood market. 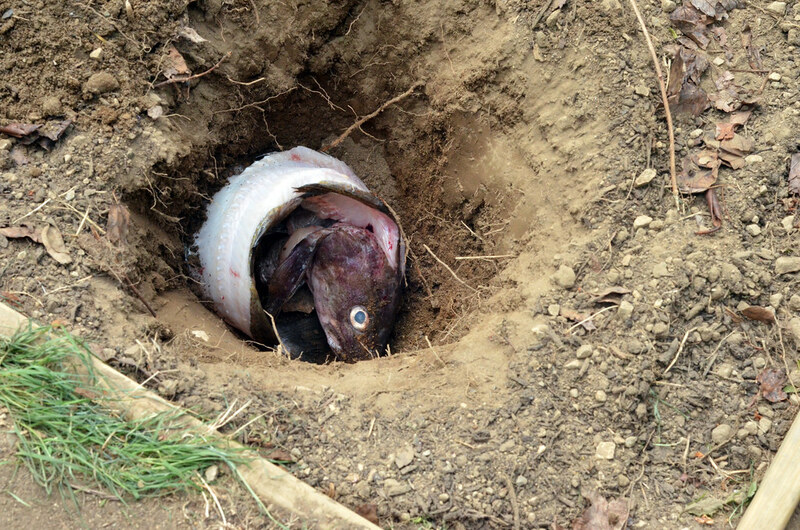 So I read somewhere that it's really helpful to bury a fish head underneath where your tomato plants will go. To this end, I stopped by our local fish market and asked if they had any leftover fish parts lying about and explained what I wanted them for. The man was very helpful but explained that these days every part of the fish is either used by them or sold off for some other purpose (cat food, fish oil supplements, etc). 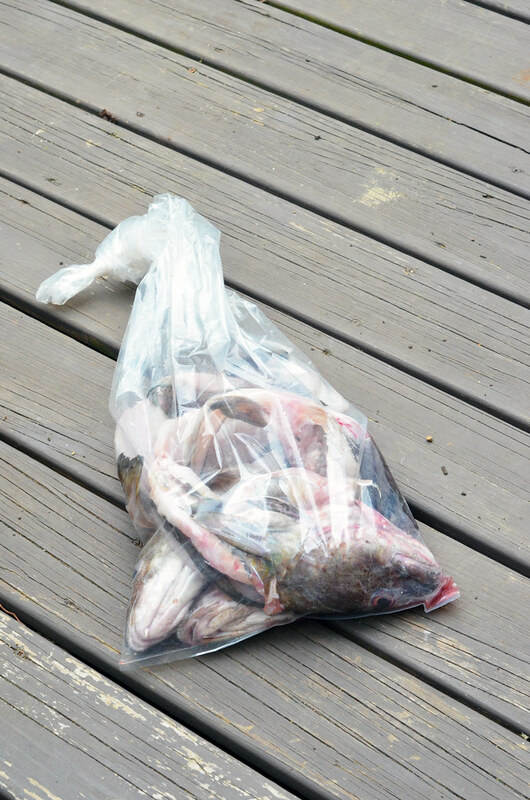 However, when he asked how many tomato plants I was planning on and I told him four, he said that wasn't a problem and went and bagged me four fish heads with backbones still attached. 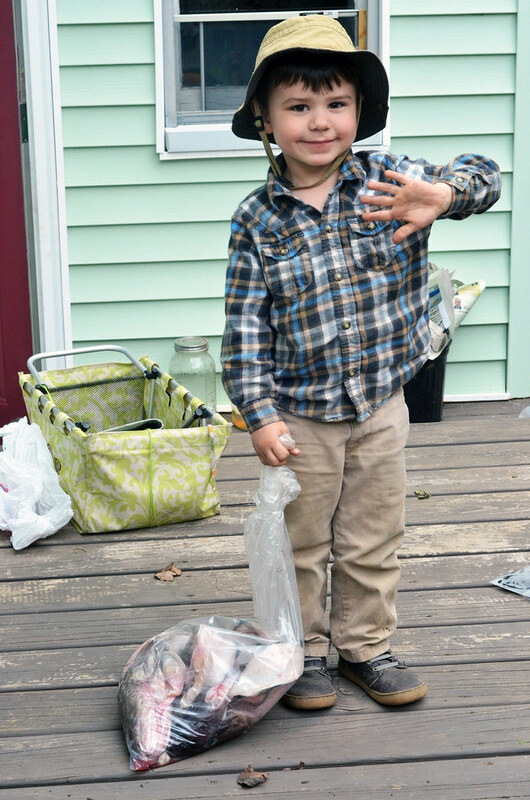 Full disclosure: I had both kids with me (on purpose as they can charm the fish heads off anyone) so that probably helped. 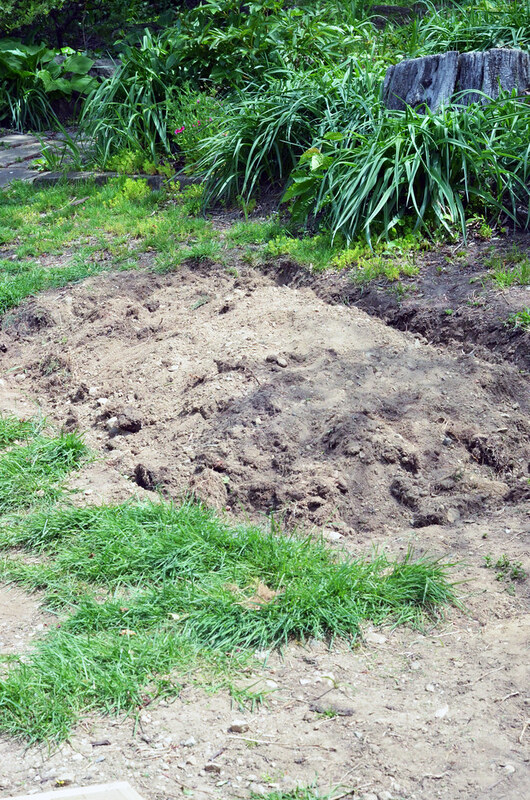 The man also warned me to dig the hole pretty deep for the fish; otherwise, critters will smell them and dig them right up. He was both enthralled and disgusted by the fish heads. 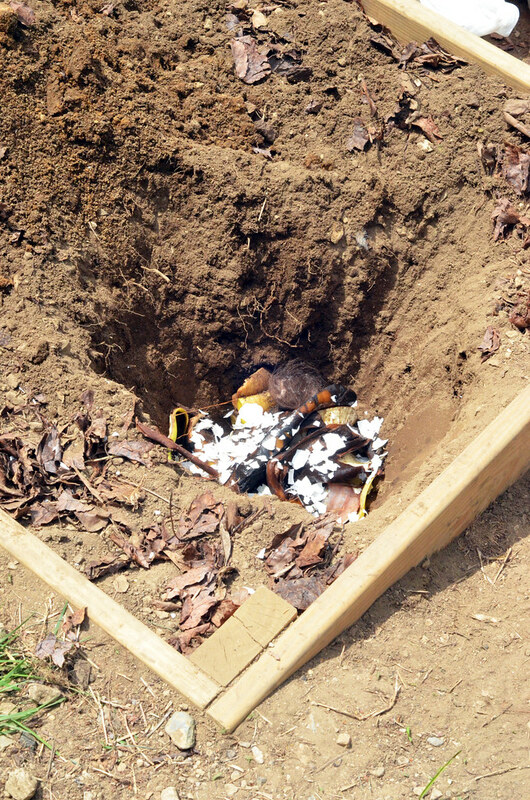 Dug a hole about a foot deep and tossed this fellow in. I had also read about a bunch of other things that are helpful to throw into your tomato plant hole so on top of the fish I added banana peels, hair (from my own head and from the cats), coffee grounds, and egg shells. Additionally, I buried right next to the tomatoes empty soda water bottles that I had poked holes in and filled partway with our homemade compost, leaving about 5% of the bottle above the soil line so that I can fill it with water when it gets hot and dry. This is to make sure that the roots get well watered. Tomatoes are such delicate creatures. 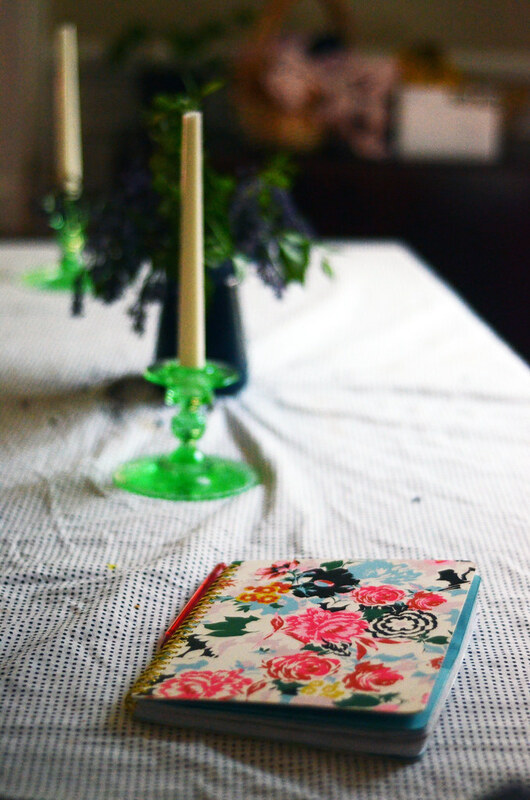 Garden journal. It's from Ban.dō and so very pretty! Back in grad school, one of the old crusty professors gave me some of the best advice I've ever gotten. 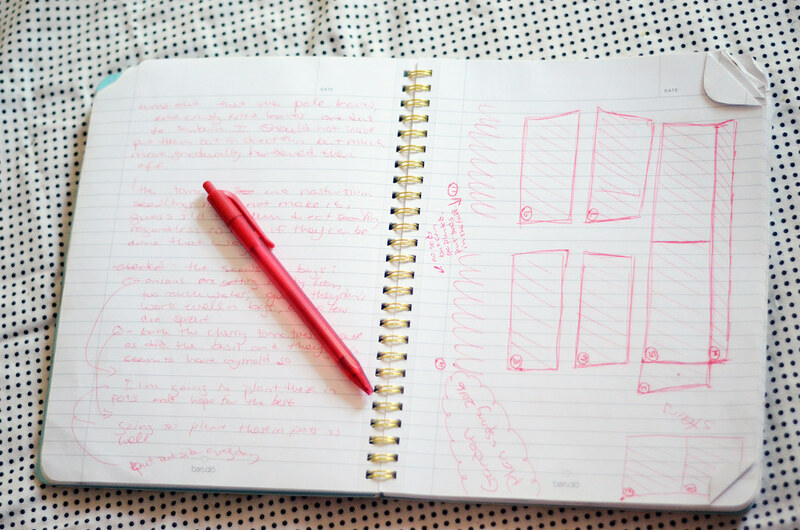 He said I should keep a journal of my research--to write down how much I accomplished each day, my current thoughts and plans on how things were progressing, etc. Doing so helped me to find a lot of clarity and direction so it's a practice I've tried to keep up for all of my major endeavors, and it has always been very helpful. Keeping track as things progress. On a slightly related note: whilst doing some random reading up on victory gardens, I came across this website/shop that I think you should know about: http://www.victorygardenoftomorrow.com. You're welcome. Happy Friday dearies, may your garden be green and glorious! Thanks Holly! We made sure to thank the fish for their sacrifice before tossing them in the holes so there's that.